Explore the worlds of today and yesterday in Central America. 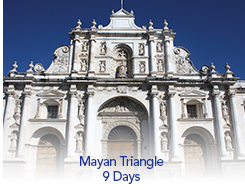 This tour balances the adventure of visiting ancient remains of the Mayan civilization with opportunities to enjoy the pristine beaches, flourishing markets and vibrant lifestyle many find so compelling in modern Guatemala, Honduras and El Salvador. 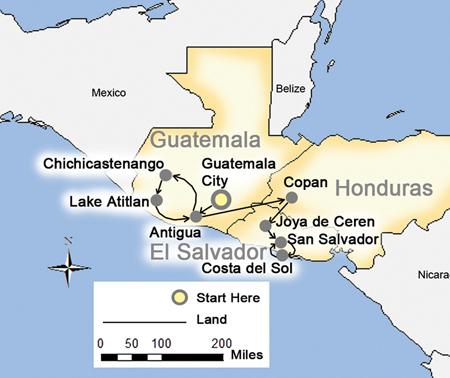 Arrive at Guatemala and transfer to Antigua, once the capital of all Central America. This is one of the best preserved colonial towns in the American Continent and is declared a UNESCO World Heritage Site. Today you will visit The Coffee Process Plantation and The Flowers route, where some of the best coffee of El Salvador is produced, also the colorful towns of Ataco, Juayua and Izalco. As a guest of SITA, enjoy tea time in El Salvador after the city tour long with a bag of local coffee in Guatemala.